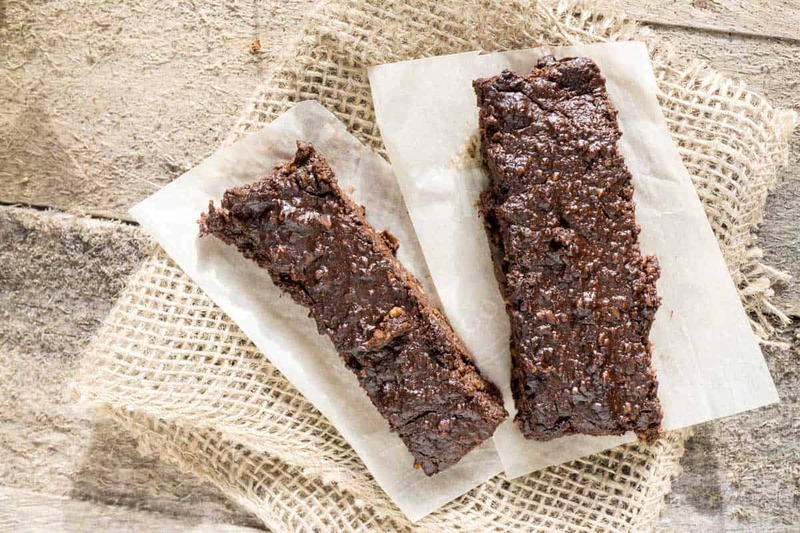 If you’ve got 10 minutes, you’ve got enough time to make these rawsome awesome protein bars! All you need to do is soften some dates, stir in some peanut butter, dump it over the dry ingredients, and press into a pan. Easy to make, easy on the wallet. This recipe contains whey protein isolate. I used to be fairly anti-protein powders. Unless you were an elite athlete, a body builder, or needed a specialized medical diet, I didn’t think they were necessary. I still don’t think they’re necessary, per se. A person can certainly live a healthy happy life without ever touching a protein powder but I also see how they can be a helpful tool. So whey protein isolate is just that: cow’s milk protein. There aren’t any added flavours, sweeteners, or other ingredients. where do I find this isolate you speak of? Also, take note: whey protein concentrate is not the same thing as whey protein isolate. Both products use the same starting material but the isolate has a higher percentage of protein. Each bar has nearly 10g of protein and 5g of fibre. This combination is a powerful snack that will keep your stomach full and your mind off food until your next meal. Combine it with a piece of fruit such as an apple or a pear for more fibre, volume, and nutrition! 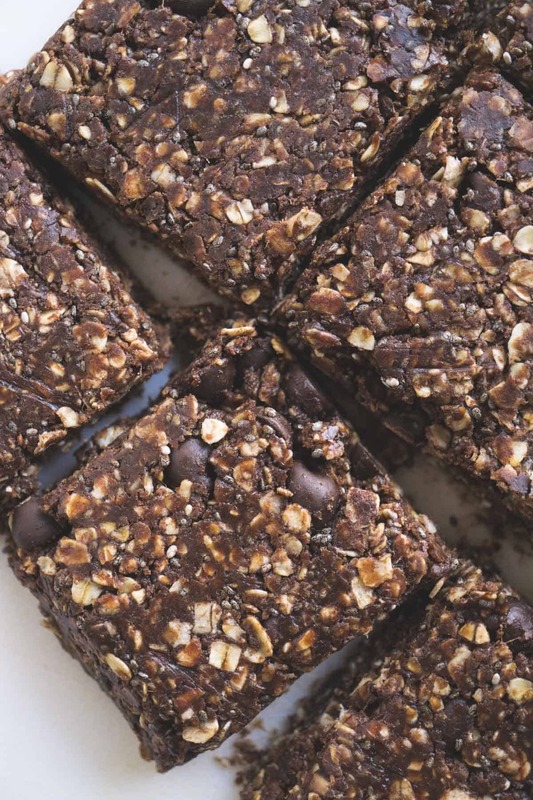 A slightly sweet, chewy DIY protein bar! So quick to make and much cheaper than storebought. In a glass measuring cup place the dates and the water. Microwave on high for one minute. Mash with a fork. Microwave on high for another minute. Mash with a fork until a paste forms. Return to microwave if they need more softening. Stir in the peanut butter and milk. In a large bowl, place the oats, whey, chia seeds, cocoa, and chocolate chips. Pour in the peanut butter mixture. Stir until well combined. Line a 9×9 pan with plastic wrap. Press the mixture firmly into the pan. Wrap each bar in plastic wrap and store in the fridge. Want more variety in your protein snack routine? 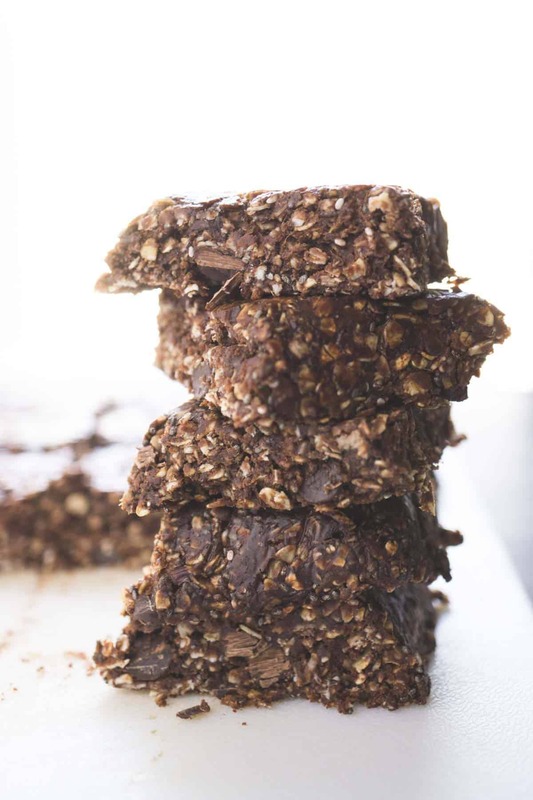 Check out this no-bake Chocolate Sea Salt RX Bar copycat recipe! 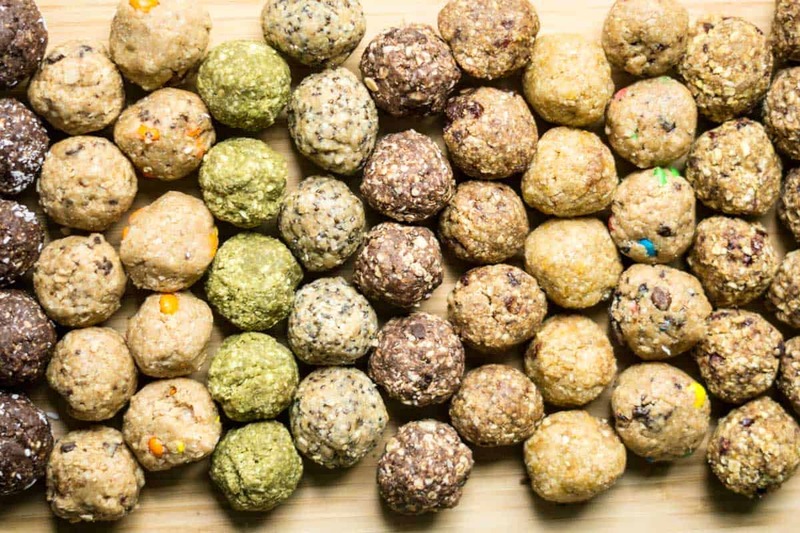 Or this easy, no-fail, no-bake energy ball mix-n-match recipe! My son & I love these Jessica! I take one when I work night shift and my son eats one on the way out the door to university. They are super tasty and filling. Awesome! I created them to be a filling snack so I’m glad they’re living up to my expectations! I have never bought protein powder before, but when I see yummy recipes like this one or a smoothie recipe that calls for protein powder, I usually skip the protein or the recipe altogether. So if a newbie like me were to buy only one protein powder, is this the one you would recommend? Yes, this is the protein powder I’d recommend. There isn’t any additional flavourings or artificial sweeteners so it’s a great base that you can flavour/sweeten in whatever way YOU want! These are great! Easy to make and pretty tasty!! Hi Jessica. I do not like dates…what would you recommend for a substitute? Hmm, I haven’t tried it but I imagine raisins could work! HI, I WANNA KNOW WHAT THE DATES ARE? Dates are a dried fruit used as a natural sweetener. You can often find them in the baking section of the grocery store. They are also known as date palms. Oh I’m so sorry it didn’t hold together for you! It really should. Without being there while you made the recipe I can’t really speculate as to why it didn’t! Yum! Thanks Jessica. I love raisins and had some soaked ones left over from another recipe so played around with this one, adding them to 100g dates, used almond butter & almond milk, added maca powder & extra dry ingredients, virtually doubling the end product. 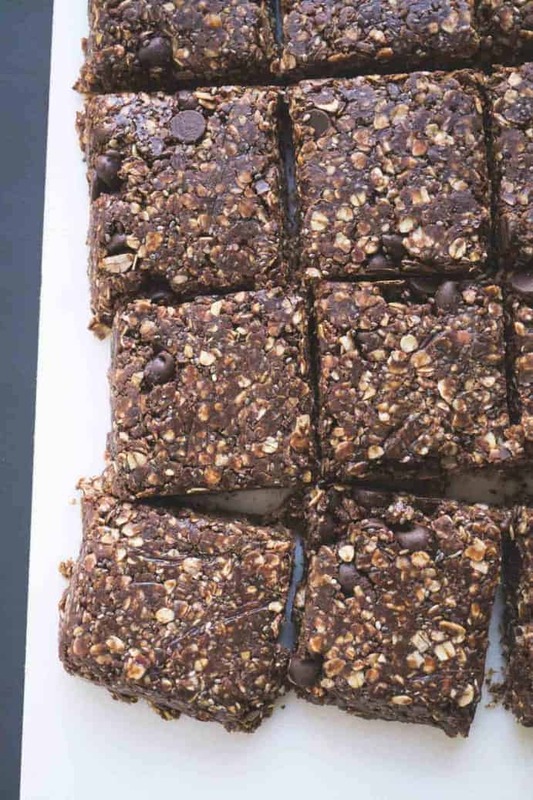 Cut them into snack-sized bars meant for between meals and post-workouts but hard to stop at just one! Cheers, Aggy. Awesome! The raisins sound like a great addition. I would love to try them with cocoa nibs! Now I just need to figure out where to buy them 🙂 Thanks for the suggestion! 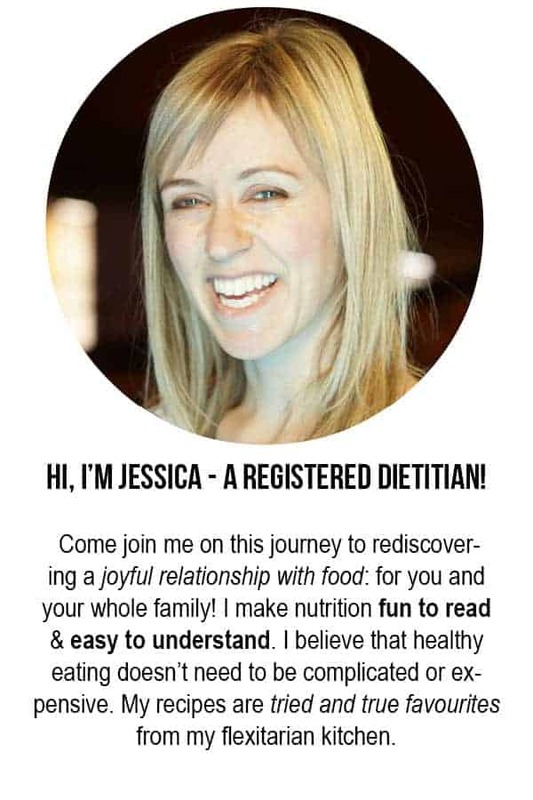 Hi Jessica, are these suitable for children? I have a 5 & 6 yr old and thought these would be great for their energy levels for their swimming lessons after school. Yes, they’re not too high in protein to be a concern. And they’re not made with “protein powders” which could have other ingredients like caffeine and such that are not recommended for children. Another natural form of dried fruit to substitute the dates would be dried non-sulphured apricots. I have used these many times in substitution of dates as I am a B blood type and dates are a no-no! Yes, dried apricots would be great! Hi Jessica. I’m looking forward to trying these, and am putting my grocery list together right now. Do you use sweetened or unsweetened cocoa? Also, does it matter what type of milk I use, skim or whole? Thanks! I didn’t know there was such a thing as sweetened cocoa! I’ll have to update my recipes to specify. Yes, this is unsweetened cocoa. What type of oats are best to use? I have old fashioned large flake and quick cooking. Thanks in advance! Either one will work! But the quick cooking will soak up the mixture a bit faster. Hi Jessica, I doubled the recipe and used 9 by 13 pan. I substituted some things such as a cup and a half of peanut butter and half a cup of almond butter. Substituted milled flaxseed instead of whey. I also added about a quarter cup of honey after tasting, for extra sweetness, as I’d like to give these to my grandchildren. Would these be okay to give to Children 3 to 7 years old? 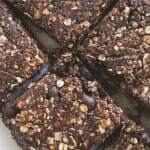 Barring any allergies or intolerances, these bars are fine for all ages! Delicious! Just made for first time and forgot the addition of unsweetened cocoa. Wasn’t missed, still satisfies the sweet tooth without the guilt! I did add pumpkin seed and flax seed! Thanks for sharing! Yum! Those sound like great additions! I made these to take to work for our snack day and they won hands down for anything else I’ve brought in, they are absolutely delicious!! I’m making them again so I can keep some for myself in the freezer. Yay! So happy you and your co-workers enjoyed them! I’ve been making these to bring with lunch for about a month now and I love them!!! With this recent batch I added a smashed, ripe banana and it was incredible! Highly recommend it. Mmm, that sounds delicious! Thanks for sharing! I was wondering if I could use a plant based protein powder instead of whey, as I am allergic to dairy? Yes, but if it’s already sweetened it may end up being overly sweet.